I love dishes that are easy to make and take and this is one of our favorites. 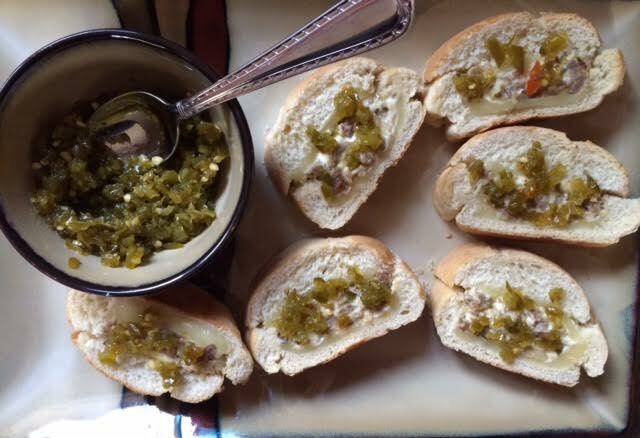 This comes from a good friend of ours, Jack who is always sharing his recipes using our jalapeños and is an awesome cook. We’ve taken this on camp-outs, football and basketball parties. It is a nice welcome for the new neighbors or a friend in need. This is so convenient to have around on those busy school nights, just place a slice in the skillet and warm up. Add onions, peppers, and mushrooms into skillet and cook until tender. Add cream cheese, Parmesan, water and seasonings. Stir over low heat until creamy and cheese is melted. Add sausage to cheese mixture. Slice the loaf lengthwise, scoop out the center bread. leaving a one inch shell all around the bottom slice. Place 1/2 of mozzarella slices in the shell, fill with the meat mixture and top with remaining cheese. Cover with the top slice of bread. Place on a foil covered cookie sheet and bake at 400° for 10 minutes. slice and serve. of course, a jar of Campbell's Candied jalapeños on the table to top off each slice is required! When we take this camping or gifting to someone, we will bake and wrap in foil tightly and then refrigerate. When ready to serve, slice into 1-1/2 inch slices, and place in a skillet until Toasted on both sides. Posted on August 18, 2016 by Campbell Gardens.